1. Cut a piece of heavy cardstock or mixed media paper 7.5" x 10.5". 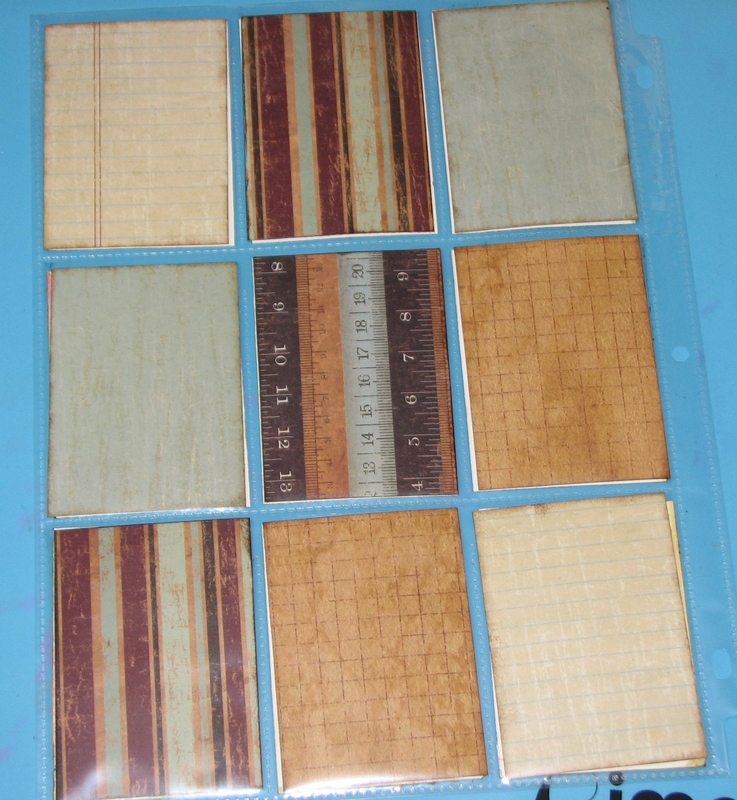 Measure and mark out 9 - 2.5 x 3.5" rectangles as shown. 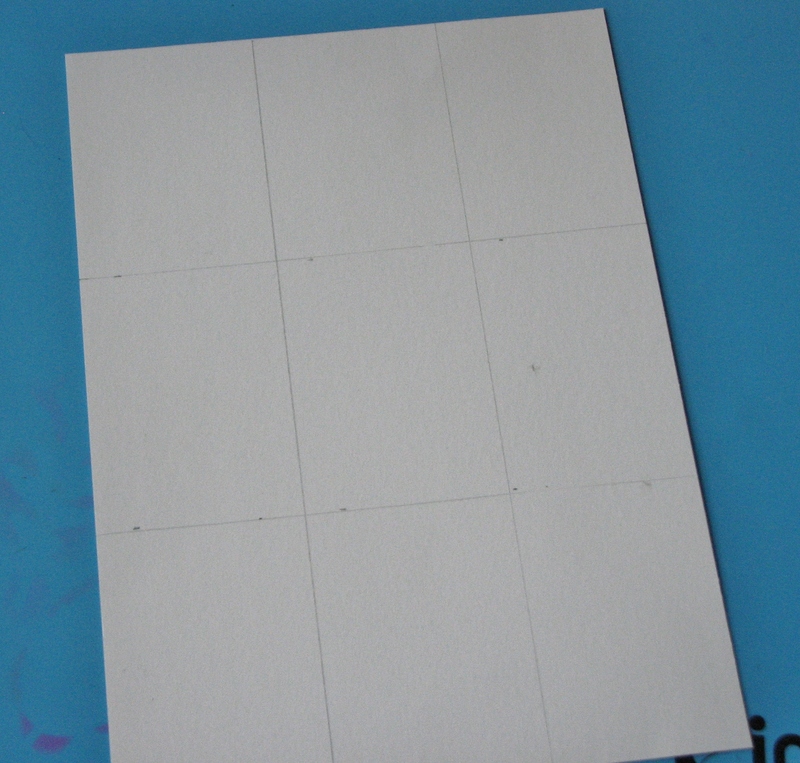 This will be a general guide for stamping and placement of various elements. 2. 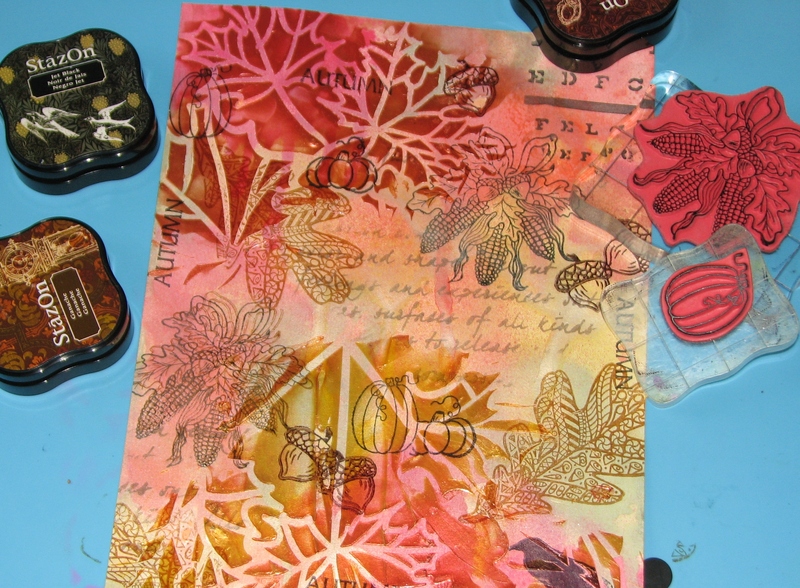 Spritz the paper with Lady Bug, Tangerine, Bamboo Leaves and Dandelion Fireworks! Spray. 3. 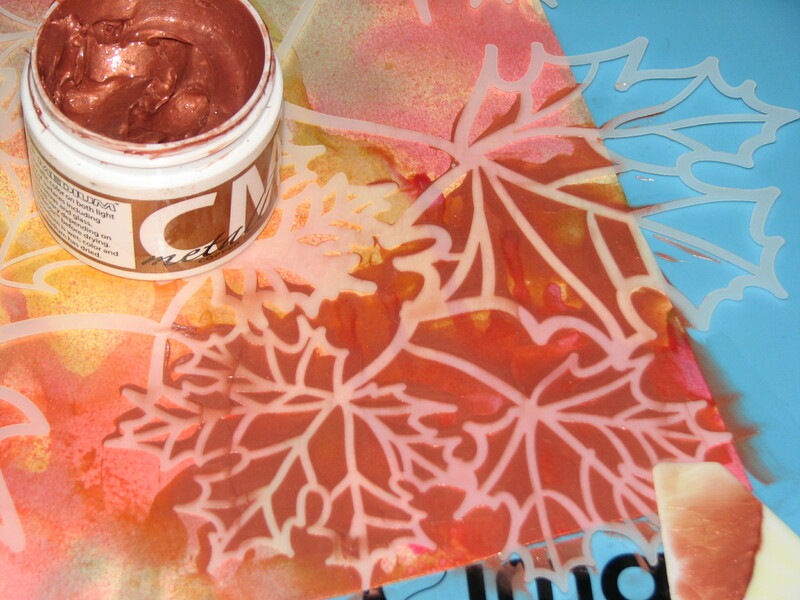 Apply Copper and Gold Creative Medium over The Crafters Workshop Maple Leaf stencil in a couple areas. 4. 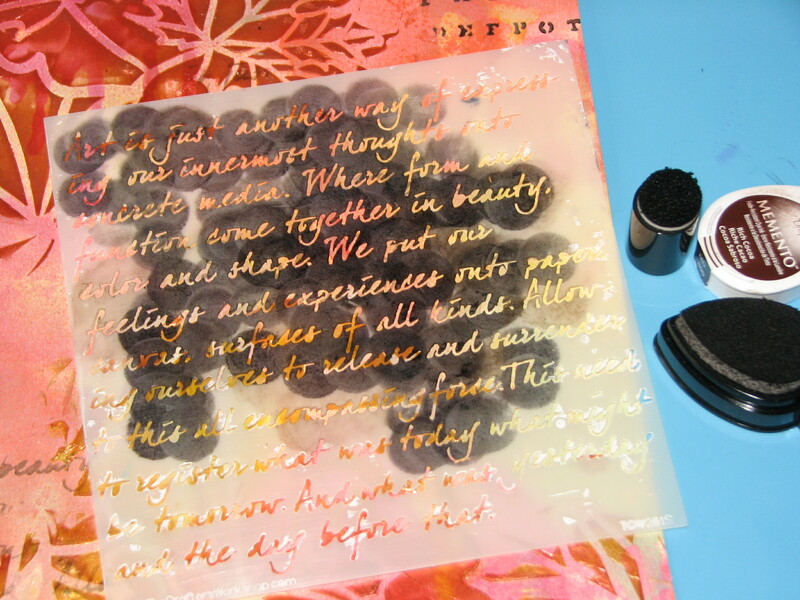 Use a Sponge Dauber to apply Rich Cocoa over the Script stencil (TCW) and Tuxedo Black over the Eye Chart stencil (ClubScrap.com). 5. 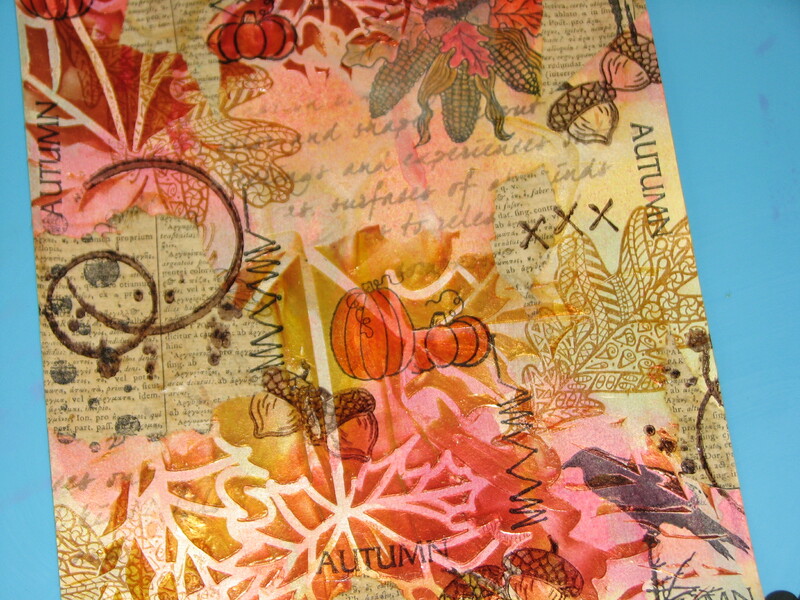 Use StazOn ink to stamp fall related stamped images over the design. You can use the pencil lines to aid in placement. Oops! Darn, I dropped a stamp over an image that I had just stamped leaving a blurry double impression. No fear - this is an opportunity to embellish! 6. 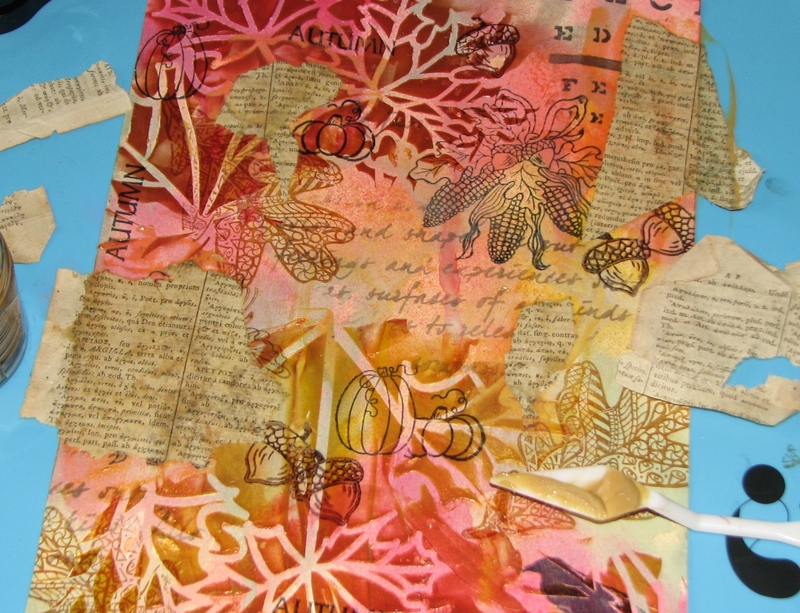 Tear up vintage text and adhere it to the paper using Antique Creative Medium covering the mistake and other areas of the collage. 7. 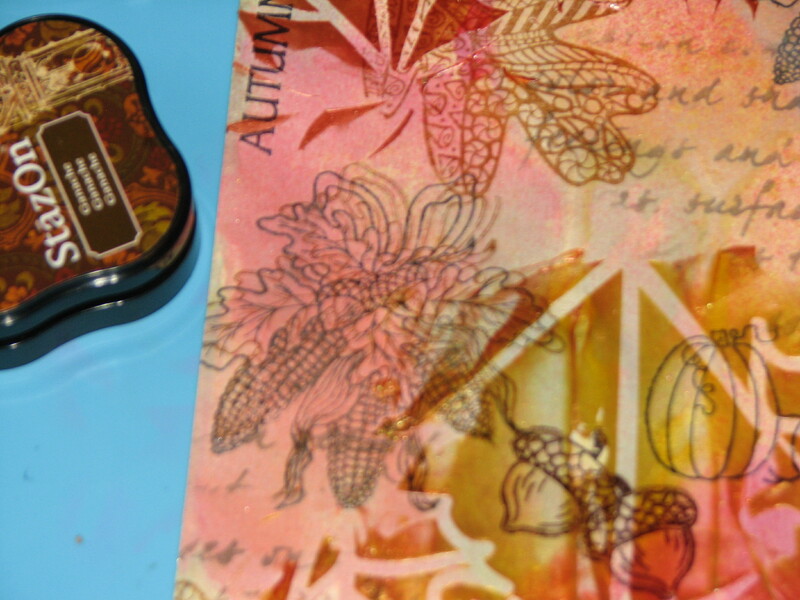 Color the stamped images using Memento Markers. 8. 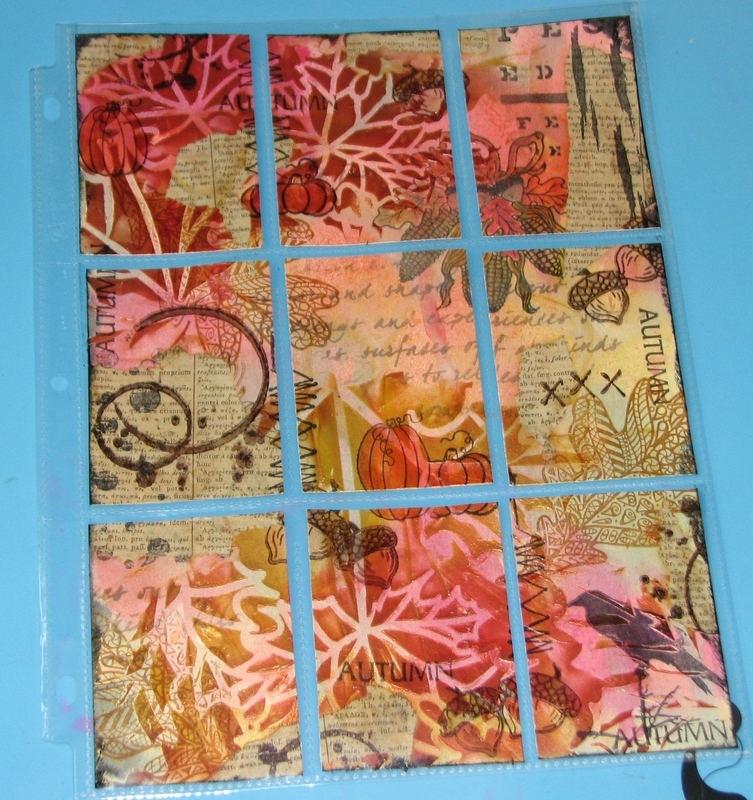 Stamp a few collage images such as "X", stitches, coffee stains, dots, etc. using StazOn inks for added depth. 9. 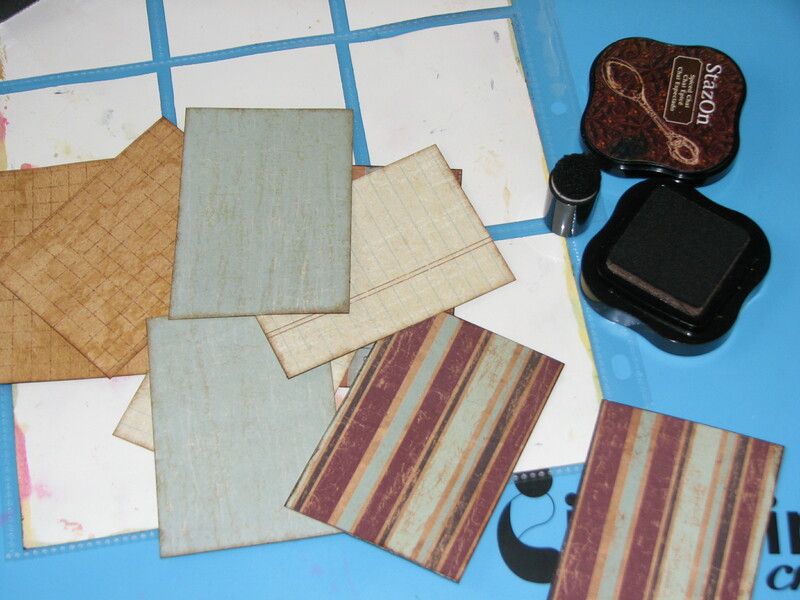 Cut the collage into 2.5" x 3.5" card and slip each card into a pocket of the baseball sleeve. *TIP - mix 'em up and create a Pocket Letter Puzzle for your friend! 10. 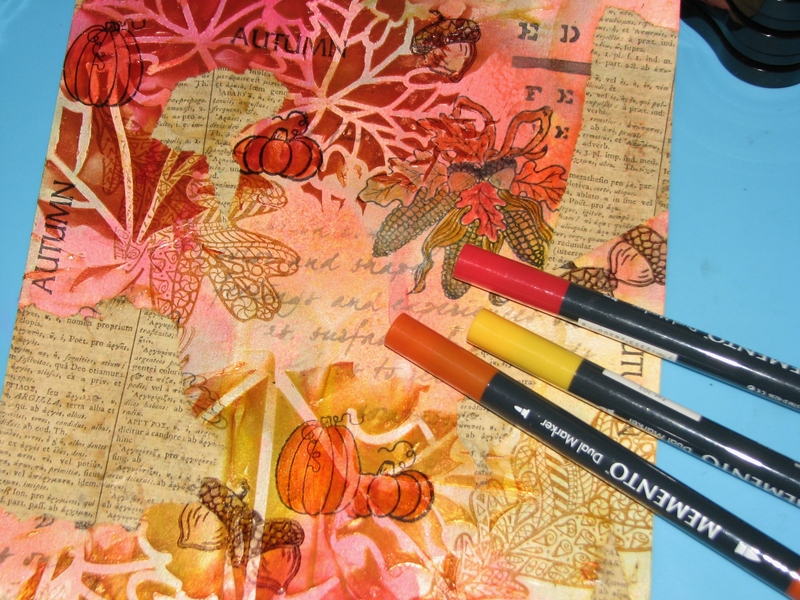 Trim coordinating pattern paper (or any paper) to 2.5" x 3.5"; ink the edges with Spiced Chai StazOn ink and a sponge dauber and slip in behind each card. 11. Fill the back side of each pocket with little goodies for your friend. 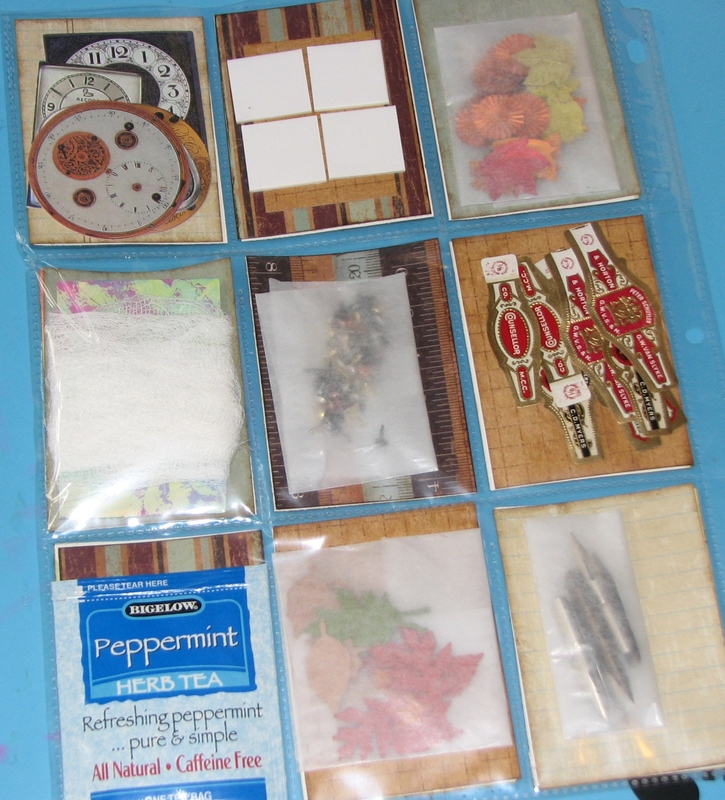 These goodies could include tea, mints, gum, candy, embellishments, die-cuts, Inchie Art Squares, vintage ephemera, pen nibs, sequins, ribbon, fiber, etc. Really anything small enough to fit into the pockets are fair game. 12. Fold up the letter, add a pretty ribbon to hold it closed and mail it off to your friend!